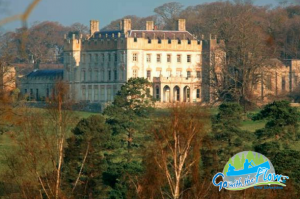 Borris demesne is the seat of the MacMorrough Kavanagh family, descendants of the high kings of Leinster. One of the best known members of this family was Art OG MacMorrough Kavanagh a fine solider who waged incessant warfare against Richard II and his English forces in Ireland. He had many close escapes from capture, and finally died in New Ross in 1417 from poison administered it is said by a jealous woman. He was buried at St. Mullins and his funeral procession was said to have stretched the 6 miles from New Ross to the Graveyard. Another well known member of the family was Morgan, who served somewhat unwillingly in the army of Fredrick the Great – King of Prussia. He was said to have been the largest man in Europe and Fredrick allowed him to visit his homeland on condition that he would return with his four brothers whom he said were bigger and finer men than he. Safely back home Morgan Prussia as he became known used to climb nearby Brandon hill on the anniversary of his return each year and make a royal salute to Fredrick.